If you're OK with keeping a creature you can't cuddle, the scorpion may suit you. The exotic predator is fun to watch hunt and feed. Scorpions don't need much food to survive, having evolved to maintain energy after several days without stinging and eating some prey. Scorpions don't need to eat every day -- eating that often can cause your scorpion to get too big too fast, crushing his body inside his exoskeleton. He will molt as he grows, but eating too much will make him too large between molting seasons. Start by feeding your scorpion about twice a week. Watch him for signs that he's not getting enough food, such as anxious skittering in his habitat or predatory behavior, pouncing on various items. If he leaves food without eating it, wait an extra day between feedings next time. 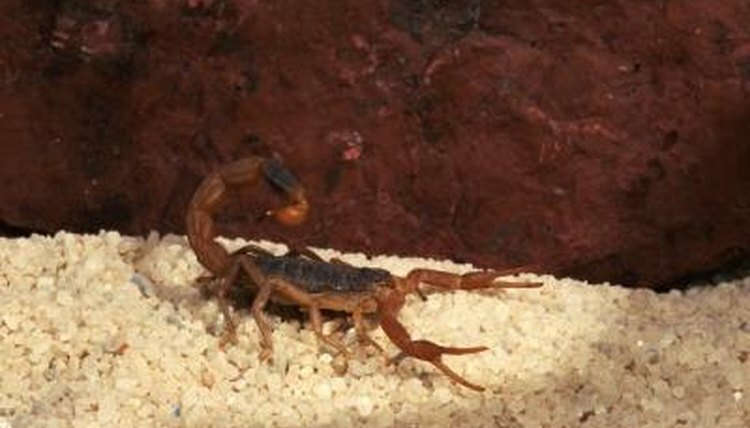 Some larger scorpions, such as the emperor scorpion, might eat every other day. Smaller ones, such as the striped scorpion, might need feeding only once a week. You'll have to establish a proper dietary intake as time goes by. Scorpions like live food, which means you need a another habitat in which to keep his meals alive. Crickets are commonly fed to scorpions -- they are easy to find at pet supply stores and are easy to care for while they are waiting to become dinner. You can also feed your pet mealworms, grasshoppers and moths. Keep the feeder insects in a container with a vented lid so they get air, and make sure they have food and water. Scorpions are healthier if they eat food that is healthy. About twice a month, separate two crickets and sprinkle them with a reptile vitamin supplement powder before dropping them in your scorpion's habitat. This makes sure he's getting the nutrition he needs. Scorpions tend to be nocturnal, hunting and eating at night, when it's easier to catch their prey unaware. Your pet isn't any different. If you drop food in his habitat during the day, he might not leave his hiding place to eat -- it's just not his natural behavior. Work with his schedule by feeding him late in the evening, after it starts getting dark. Drop the insects in his tank without putting your hand within reach of his stinging tail, or use small forceps to place the insects close to your scorpion. Although a scorpion doesn't need much food, he can't survive long without water. Keep a shallow dish with water in his habitat all the time so he can drink as needed. Placing some river rocks or gravel in the bottom of the dish helps ensure he won't drown as he tries to drink. Clean it every couple of days and replace the water to make sure he doesn't drink any that might have become dirty as he crawls through it.